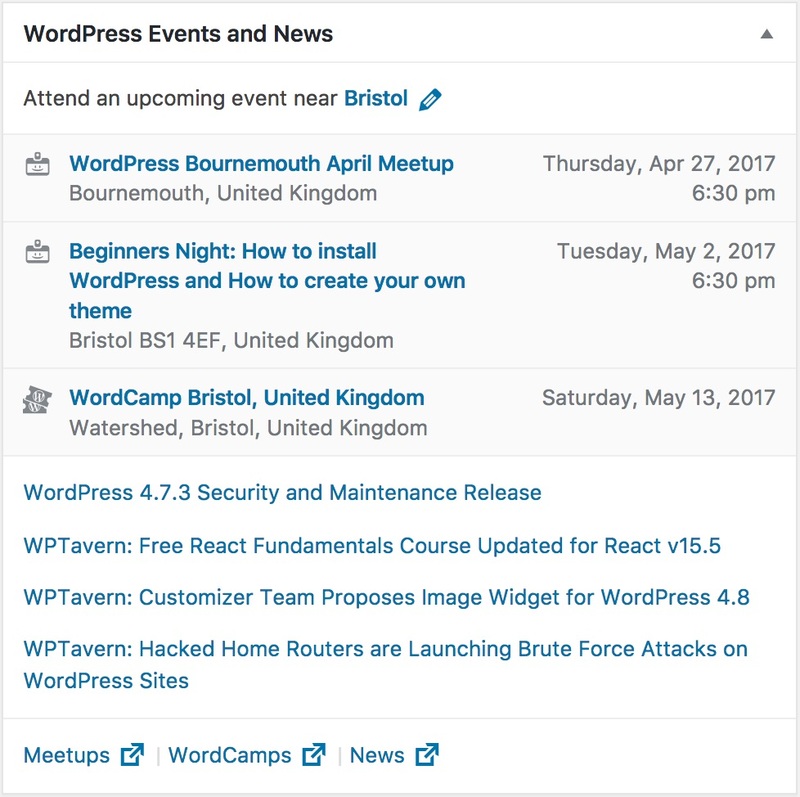 In an effort to grow awareness of WordPress community events like WordCamps and meetups, a group of us have been working to upgrade the WordPress News widget, adding WordCamps and meetups, as Matt mentioned in his recent post. We’ve created a plugin (background) called Nearby WordPress Events for testing and iteration. It turns the existing News widget on the Dashboard into WordPress Events and News, with a short list of upcoming nearby events above the usual news items. In order to display events that are “nearby”, the plugin uses a determined location for the current user. If a site has multiple users, each one will be shown the events that are close to their individual location. The widget tries to automatically detect a user’s location, but they’ll also be able to enter any city they like. We’ve solicited the Community team for testing and feedback and have made several improvements. Now we’d like to take it to the next level and get feedback from the Core team, in preparation for a proposal to merge it into Core, perhaps for WordPress 4.8. Location detection: Does the widget accurately detect your location? If not, be sure to report your approximate location at the time you started using the plugin/widget. The best place to file issues is the GitHub repo. The idea is good, absolutely! I’ve just installed and checked it and it work like a charm. Very well done. I was wondering if there are any plans to make these information also available public as a sidebar widget? None right now, but I’ve heard a few people say they’d like that. I think it’d be a great opportunity for someone to build a separate plugin that re-uses the code from this plugin to get the event data, and then creates a front-end widget with it. Very excited about this coming into core, it has the potential to really extend the reach of our community events. For what it’s worth, I’ve been discussing this with WordCamp attendees (primarily those who are there on behalf of their company, or have just paid for a new WordPress site and must learn how to use it) and people have been reacting positively. It’s hard to know what to trust when you’re just getting started. Just tested the widget a bit more. Also, somehow the default location is Beaverton, OR, even though I am in Europe. That’s pretty weird. After changing the city and hitting Submit, I would expect the form to collapse again. Instead I need to manually click on ‘Cancel’. It looks like the Zurich group isn’t an official group (i.e., they haven’t joined the chapter program and agreed to the 5 good-faith rules), which is why their events don’t show up. If they join the program, then their events will automatically start showing up. The default location is determined by IP address, timezone, and locale, which isn’t always accurate, but is the best we can do for now. If you’re using a VPN in the states, or have your locale set to `en_US`, that could cause the location to be determined as Beaverton. The form doesn’t collapse for accessibility reasons, but we’re exploring ways to improve the UX there. I tested it for the first time in latest core build, accessing from Fredrikstad, Norway. Language set to Norwegian (Bokmål). Result: LONDON. Another site with site language not set (en_US) also suggests LONDON. To some degree that’s expected, but since other databases are showing your IP correctly, there might be some room to improve ours. I’ve created #2823-meta to work on that. Hi @knutsp, I think we’ve fixed this. Would you mind testing again? I have deleted the usermeta entry between each test. Result: Far better, it now shows “Tønsberg, Vestfold, Norway”, but still far too inaccurate to be helpful. And I try from another location near Oslo, and it also shows “Tønsberg, Vestfold, Norway” (after deleting meta, no caching). At same time I notice there is a meetup listed in Tønsberg and in Oslo. Question: Does it show the nearest place/city with a meetup or WordCamp, or does it show actual location? I now must suspect the first. You’re right, it does show the nearest city with a meetup. That’s due to licensing issues with the geolocation database (see #2823-meta) . Unfortunately, I think it’s a trade-off that we’ll probably have to live with in the short term. It’s something we could take another look at once higher priority things have been sorted, though. In the mean time, entering `Fredrikstad` manually should work. I think this is a wonderful idea. Meetups and WordCamps are very important to maintain a healthy and thriving community. Without which, there would be no .org. So thank you. Also: Meetup is capitalized because it’s a brand name. In this case we’re using the generic term, not referring to Meetup.com specifically. Most WP meetups use Meetup.com, but not all of them. Pretty soon we’ll be pulling in events from other APIs too, like DoorKeeper.jp for the meetups in Japan. @iandunn Does this new widget change anything in the behavior of the news section? If not, the first one should be slightly highlighted from the rest of three, because these are two different feeds. The news feeds are still the same content, just styled differently. IIRC, the w.org/news one was intentionally un-highlighted to make everything more streamlined. @mapk can correct me if I’m wrong. Okay, I disagree with the decision, but thanks for the clarification. One of the links should get a context, so that we can translate these links differently. Ah, great catch! Would you mind creating a core.trac ticket for that? What is going wrong here? How can I invalidate the cache? It looks like that meetup group hasn’t joined the chapter program yet. We only promote official groups, since some of the unofficial ones do things that contradict the project’s values, like using the group to promote the organizer’s business, or charging for attendance and pocketing the profits. When a group joins the chapter program, their events will be included in the widget automatically (within about 24 hours). Thanks for the quick response, Ian. I wasn’t aware that only groups that were part of the chapter program would be included in the nearby events. That’s not included in the documentation, perhaps someone can add it? Yes, I’m very familiar with the community program. I applied Metro Detroit WordPress group for it several years ago when the program was first started, but was turned down (long story). At this time, the Metro Detroit WordPress group doesn’t have plans to join the program.